To make this easier for you, we've compiled a list of our favorite free marketing analytics tools that can help you drive better performance for your company. We hope this helps you find the marketing analytics tools that fit best with your goals and your overall strategy. If you are an experienced marketer, you know content is king. Social media, blogs, content offers, and videos, are all forms of content your company should be publishing on a regular basis. Making content that converts, however, is different than simply hitting publish and waiting for the traffic to flow in. Here are 2 free tools you can use to help optimize your content performance. One of the most useful content tools your company can utilize is Headline Analyzer from Coschedule. This unique tool will let you type in any headline you have created and then it will analyze it and provide feedback. Using this tool will help your company put together more compelling headlines that will drive more traffic to your page. The best thing about this tool is you can use it to analyze any headline you create. Whether you use it for an email subject line, a YouTube video, or a blog post, Headline Analyzer can help you craft the best headlines for your content. Keep in mind that this tool helps you use data to craft the headlines based on known data points - but you'll still want to A/B test versions of that headline to maximize opens or click through rates. Another useful content tool is Hootsuite. While there are paid plans for this tool, you can also use Hootsuite for free. 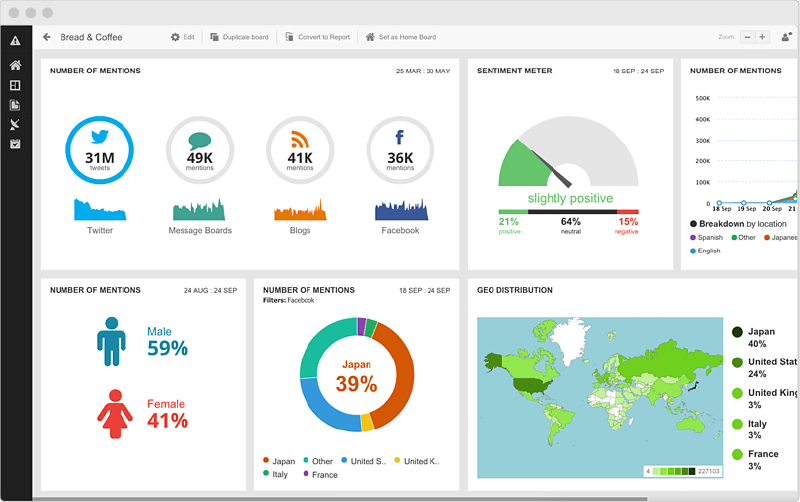 Hootsuite is a one-stop shop to managing your social media and analytics. The free version of Hootsuite allows for one user to manage three social profiles. 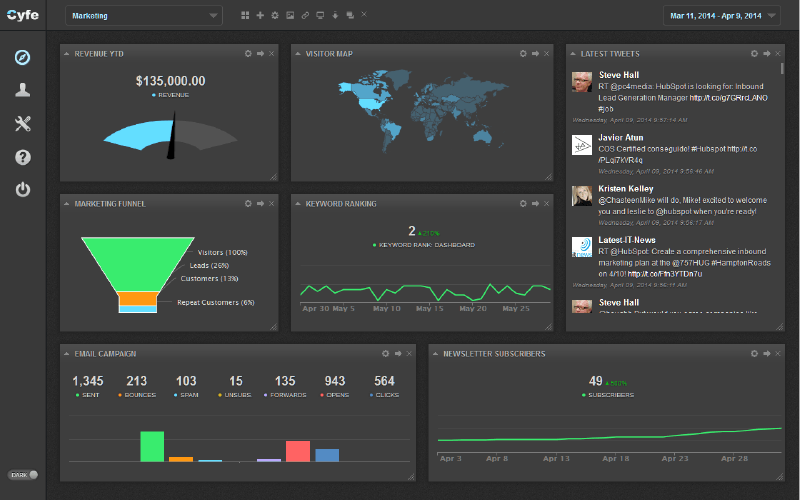 We believe the most useful feature of Hootsuite is its ability to track basic analytics. These analytics alone can help you post more engaging content and see what falls flat. It can also help you think about what time of day works best for posting. Bitly is another free marketing analytics tool that can be useful when it comes to link management and tracking click through rate on various content promotions. 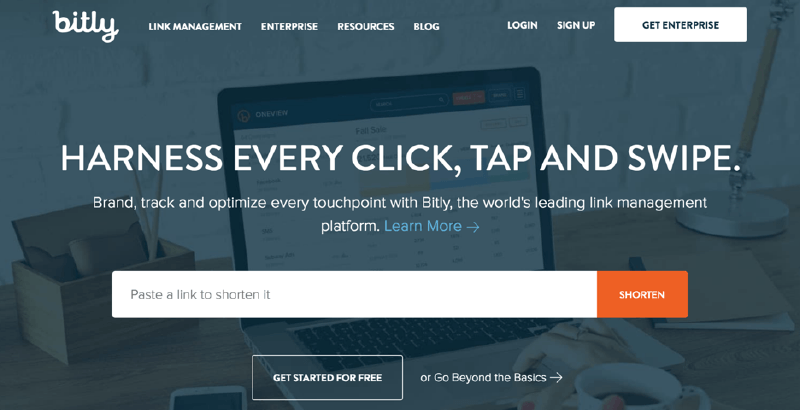 Bitly is a tool used to shorten links on your website, create brand consistency, and drive up your Click-through-rate (CTR). While shortening links is the main feature of this tool, it also allows you to track data on individual links and see how you can drive better results. Some of the most helpful marketing analytics tools analyze webpage performance and search engine optimization (SEO). 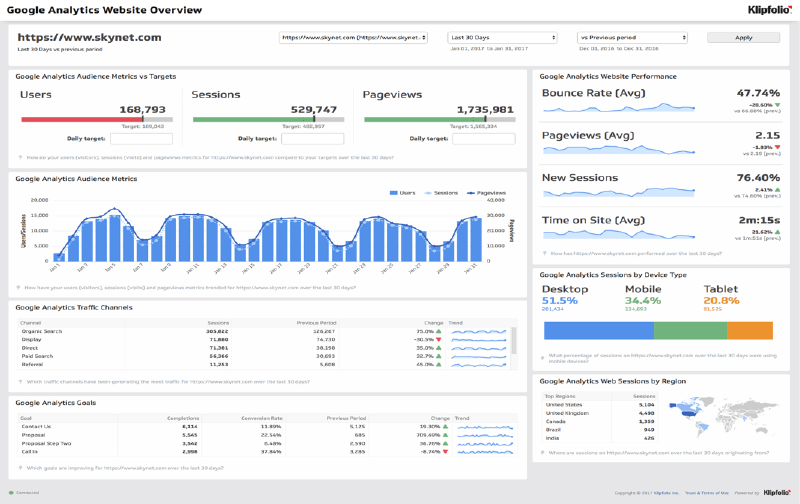 These six tools that will help your company analyze your webpage, track its visitors, and drive more traffic overall to your page. Clicky is a fantastic website analytics tool to use for companies who are in their early stages of growth. If you are operating a website that drives under 3,000 page views a day, Clicky is free! 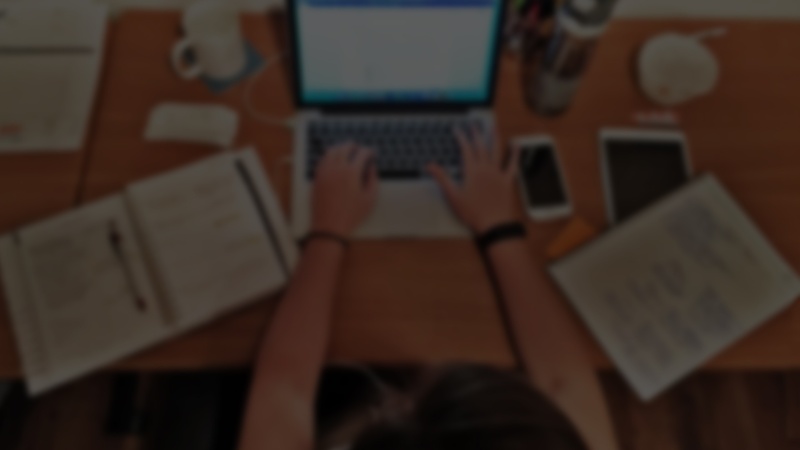 Clicky is helpful for growing companies as it offers analytics tools that track your website visitors in real time, track content engagement, and even searches made on your site. Using these analytics, you will be able to find which content matters the most to your website visitors and optimize your site accordingly. 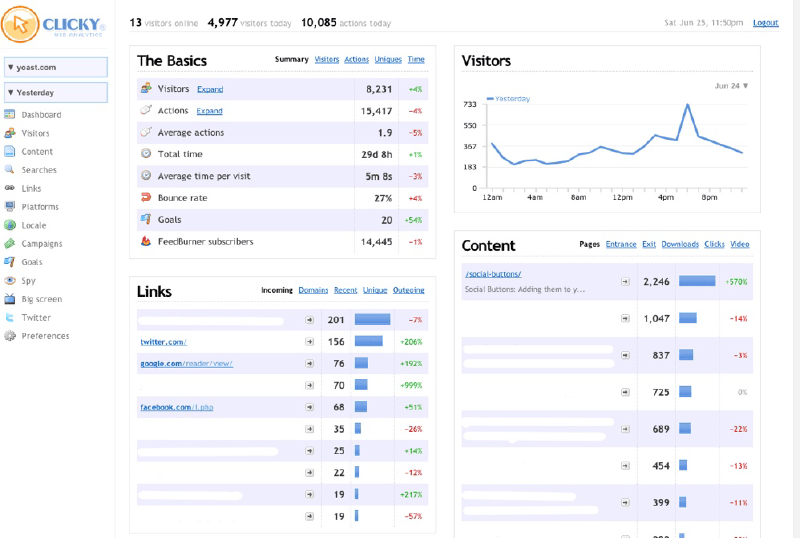 Matomo (formerly Piwik) is one of the best free web analytics tools available right now. This tool is completely free but does have the added perk of adding plugins through the Matomo Marketplace. This tool can do just about everything pertaining to website analytics, and the best part is that 100% of the data stored on this software is the users and there are no limits to the amount of data you can store. While this does not have as many unique features as the previously listed website analytics tools, Google Search Console is an important (and free) tool. We believe every company serious about growth and SEO should at least know the basic attributes of this tool. Google Search Console (formerly known as Google Webmaster Tools) allows for users to see how their site is performing in the eyes of Google. One of the most important features of this tool is its ability to track the crawlability of your site. If Google cannot access your content, you will never rank well resulting in minimal page views. Another important feature to note about Google Search Console is it's ability to track the specific search queries that lead to your content. You can see what phrases people are typing into a search engine for your site to appear in the search results, and you can also see what rank that phrase has, and how many visitors click through on those terms. If your website uses schema markup, you can see how that markup is performing. Google Search Console also helps you identify broken links (404 errors), as well as inbound links to your site and any security issues. Open Web Analytics is another great free website analytics tool. Since many of these features are common in most free website analytics tools, you might wonder what makes this website analytics tool stand out? 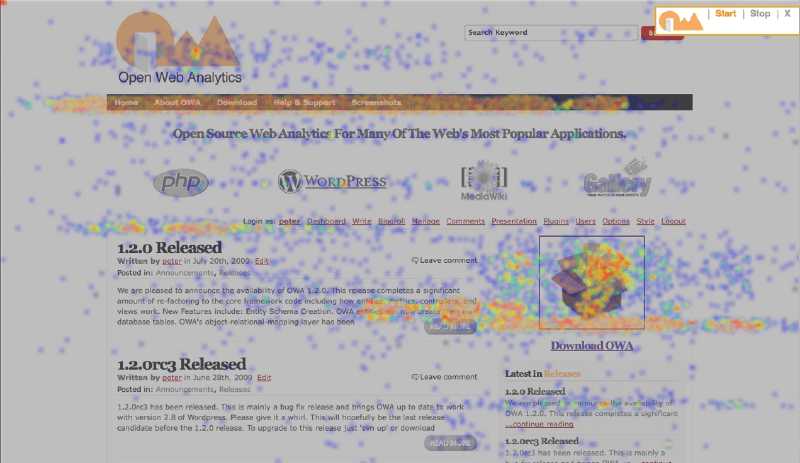 Open Web Analytics includes a heatmap that you can view to see where your visitors are clicking the most on your website. While this can help you find out what content is driving the best results, it can also help you format your website to drive even more engagement. Last but not least for website analytics tools is Google Analytics. Because Google Analytics is free, every business should be utilizing its capabilities! This tool has many basic analytics features that will help you understand your website visitors and track your performance. Many of the different data reports can be easily shared with your team. Because there are so many different marketing and website analytics tools, using too many different tools can sometimes get confusing. Often it helps to use a tool where you can manage all of your analytics in one place. Here are two free overall performance dashboards you should try out. Cyfe stands out to us as one of the most useful overall marketing performance dashboards because it measures all of your company's analytics from website, sales, social media, and even IT. Cyfe has it all, and can bring all of its data together to help you optimize your marketing campaigns. Because this can measure such a wide range of data, this is one of our favorite business performance dashboards. Last but not least is Databox. Databox is another free overall performance dashboard and comes with a ton of unique features - including the set up of three users for free! This feature stands out because most free versions only allow for one user. Databox allows for integration of 60+ apps in the free version. Specifically, you can integrate things like social media accounts, HubSpot, Salesforce, and any other software you are using to measure your company's growth. Having all of these things in one place keeps everything organized and can help you focus your team on specific goals. Now that you have an overview of some of the free marketing analytics tools being used, it's time to figure out which tools work best for your business. For smaller businesses looking for basic analytics we would recommend finding a website analytics tool and mastering it. 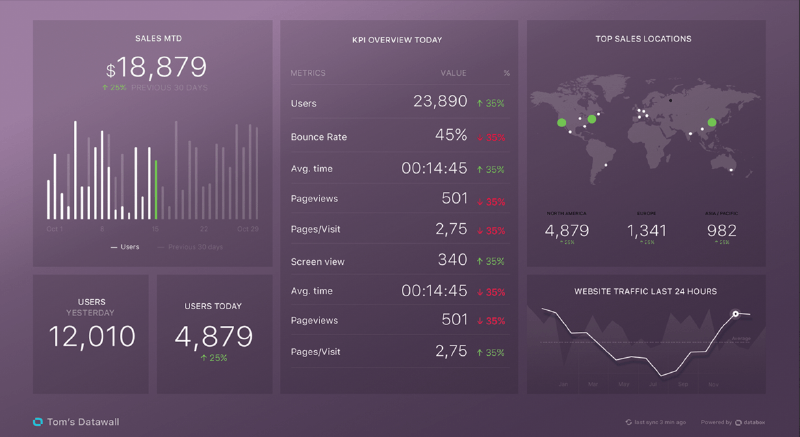 If your business is already having success with analytics tools and using more, it would be helpful to utilize an all-in-one business dashboard. If you have questions about any of these tools, feel free to drop us a note or comment below.